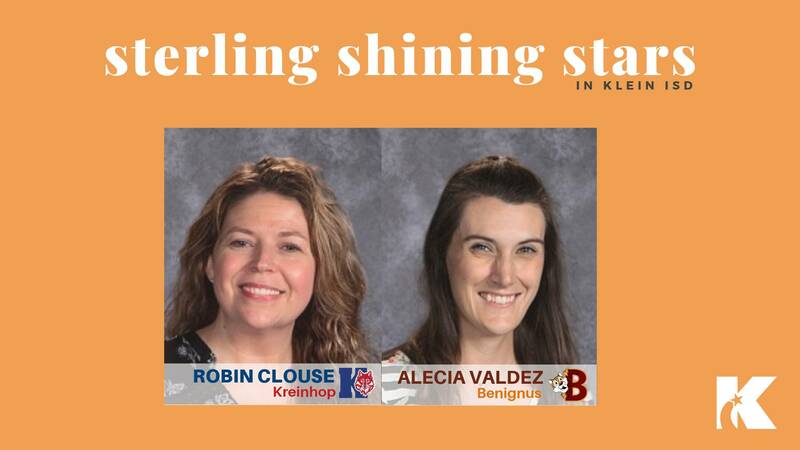 Klein ISD Elementary Teachers Robin Clouse of Kreinhop Elementary and Alecia Valdez of Benignus Elementary are nominees for the Sterling Shining Star Award, a program that recognizes and rewards school staff who make outstanding contributions to developing and nurturing a positive school environment. Each P2P Investor was nominated by a peer for her unwavering commitment to serving others – inside and outside of their own classroom. This “we” not “me” mentality is evident as both teachers have also recently served as Teacher of the Year for their respective campuses. Valdez, a fourth grade ELA teacher, is best known on her campus for being the driving force behind implementing a standards-based grading strategy in order to reimagine learning for today’s students. Kelly Hammons, a colleague of Valdez, applauds her deep understanding of high-quality teaching. Clouse, a developmental special education teacher, is noted by multiple colleagues as not only being viewed as a natural-born teacher but also for being the epitome of student-focused and relationship-driven. Congratulations to these two amazingly committed educators for being recognized as nominees for this award.